Hello, welcome to the travelogue of Jeff Mason, Cisco Networking Academy teacher at Newport High School in Bellevue, Washington, USA. 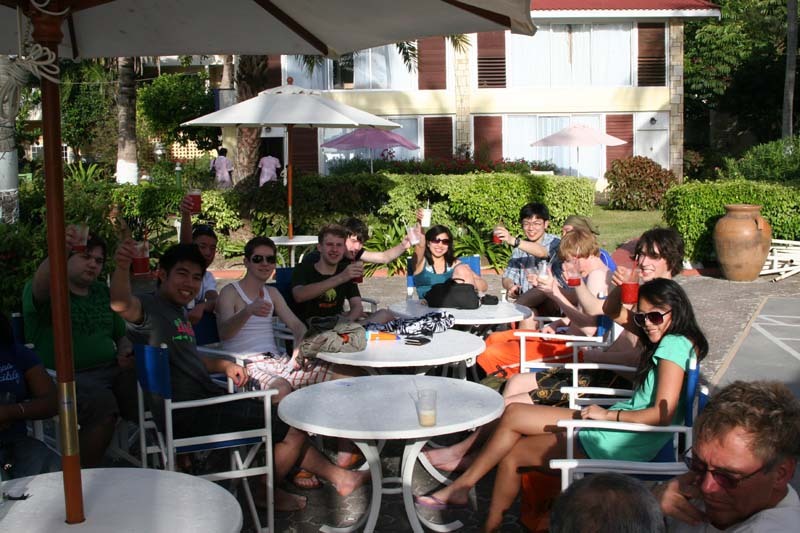 Thought I would give you a little taste of our trip so far to Antigua. Joining us on the project were myself, Rod Thompson, Cisco Instructor, Newport High School and his wife Connie. John Martinka was the Rotary project Coordinator along with his wife Jan. Rotary Assistant District Governor Steve Lingenbrink, his wife Terry and their two kids Rachel and Sarah as well as BBRC member Sadru Kabani. For students we had team leaders Sean, Lily and Reilly; team members Colin, Alex, Jeremy, David, William, Tiffany, Jeremy, Matt, and Steele. 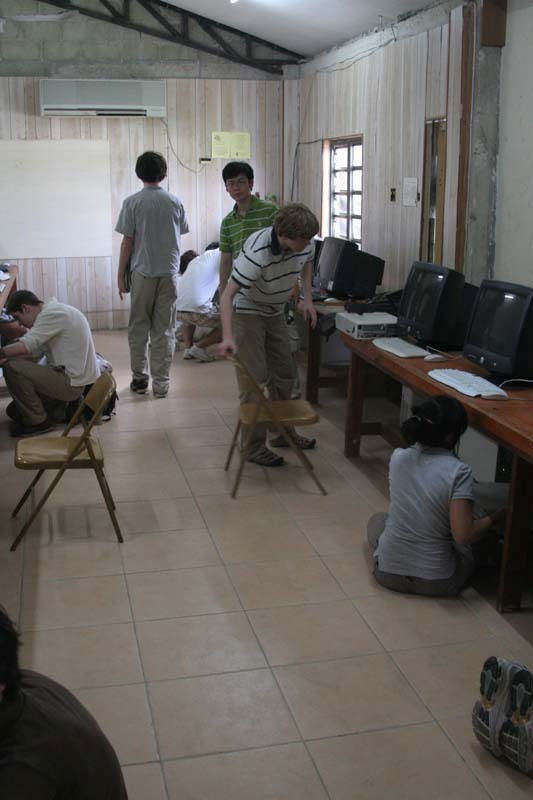 Newport High School in conjunction with the Bellevue Breakfast Rotary Club brought 12 students and 5 Rotary members to Antigua to build, network, and install 225 computers in 12 computer labs across the island including four blind schools. 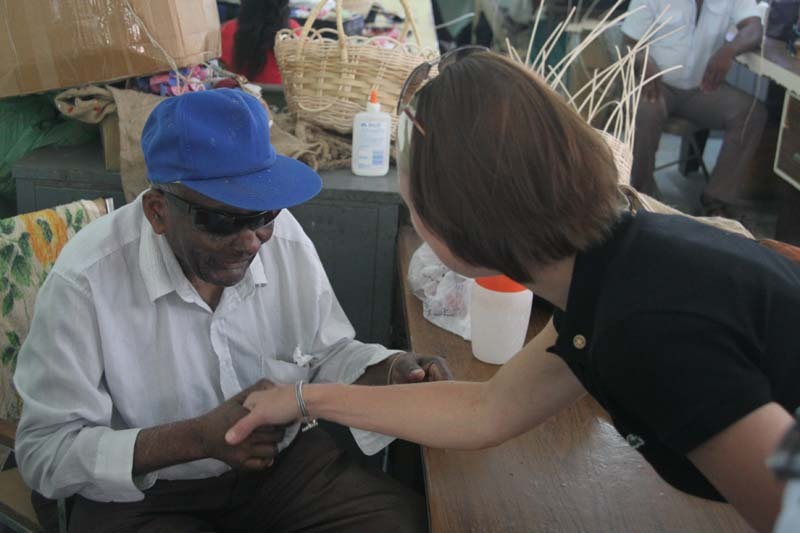 Here Terry Lingenbrink is meeting a gentleman at a blind workcenter where we installed some computers. So from the beginning-----We flew out Friday, April 4th at 7:15 AM. 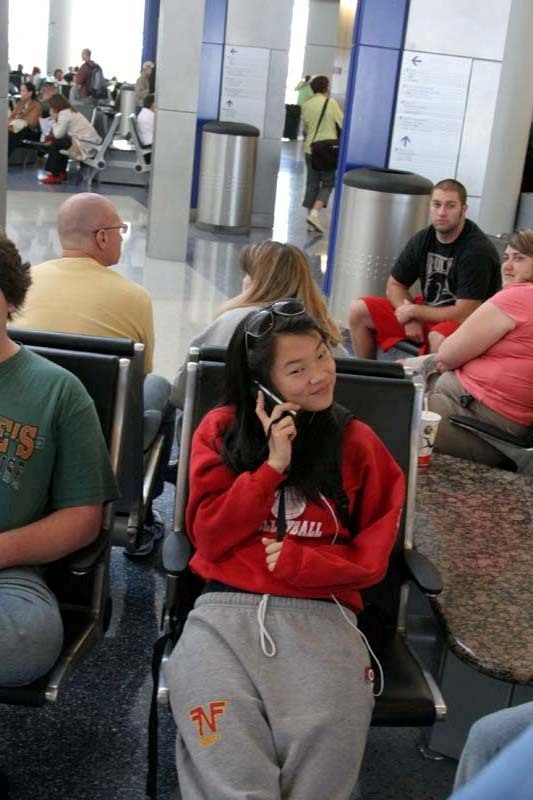 This is a picture of Lily making her last call in the U.S. An addicted texter, she is currently undergoing texting withdrawl but is surviving (barely). Come to find out, someone, who will remain unnamed--WILL, loaned her his Sidekick so she is back to texting like mad. 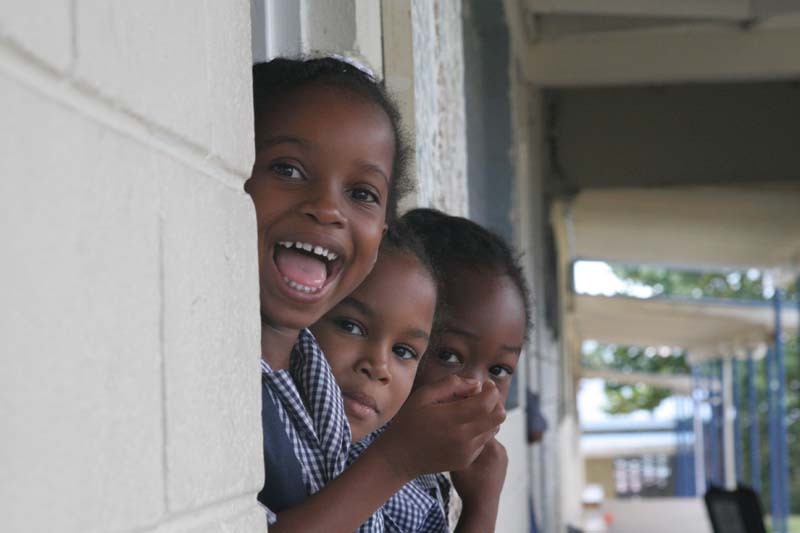 We landed in Antigua late Friday and sent the kids to their host families. They are each staying in pairs with local Rotary families. 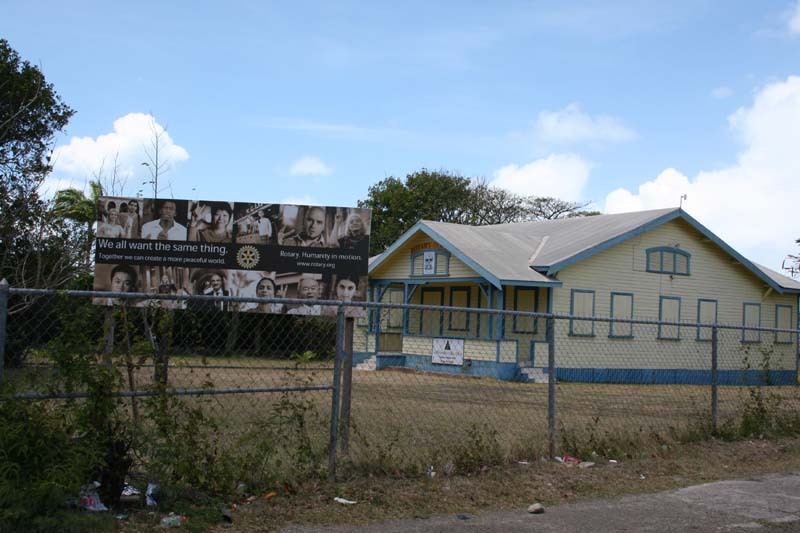 This is a picture of the Rotary house where they hold major functions and support Junior Achievement. It is near the parliment building as well as the presidential offices. Early Saturday morning the adults awoke and decided to visit the local Farmer's market to purchase some fruit for breakfast. 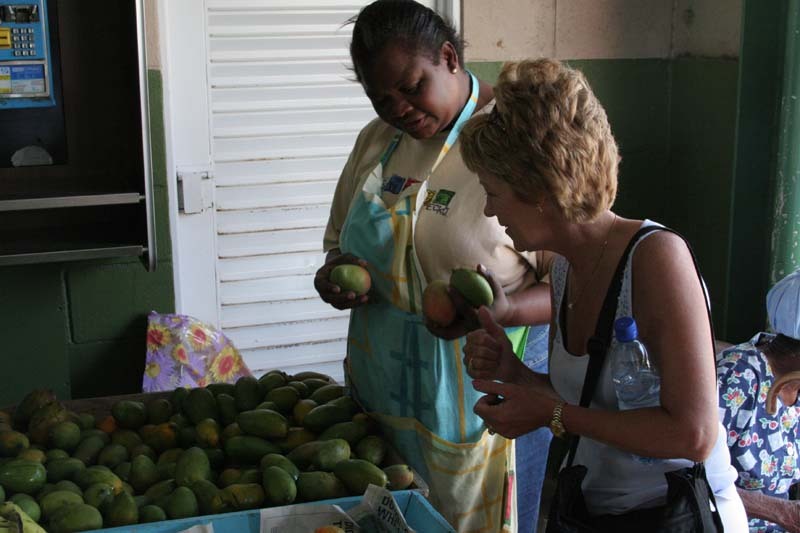 This is a picture of Connie picking out some wonderful fresh mangoes. If you haven't had fresh mangoes (and no, the ones in Safeway don't count) you are missing out. Wow, they are good! 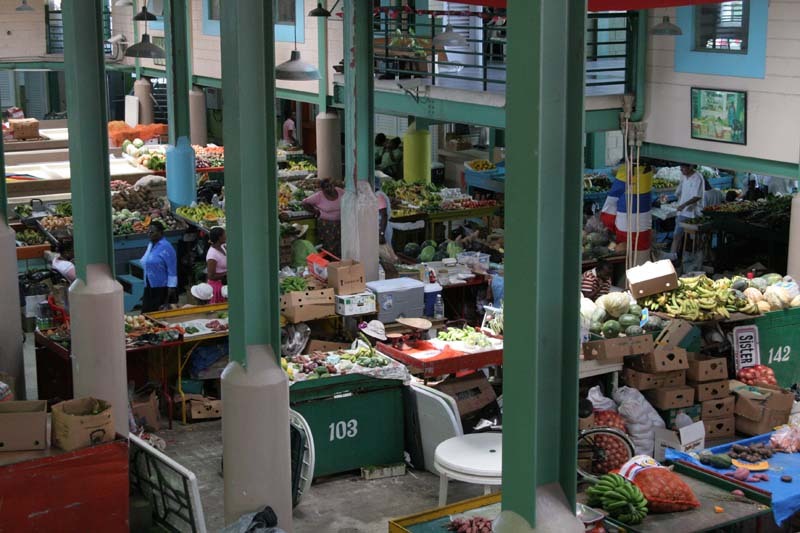 This is a partial view of the market. Rows and rows of fruit and vegetables from local vendors. 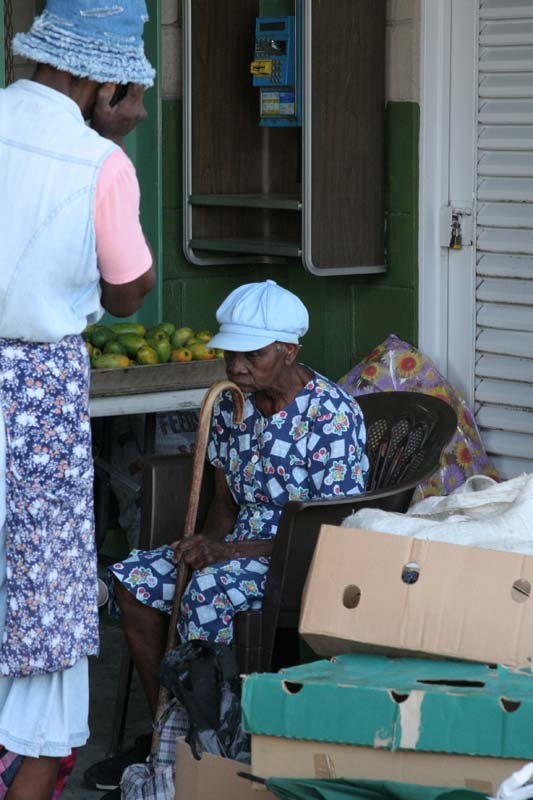 This was a local blind vendor selling mangoes. 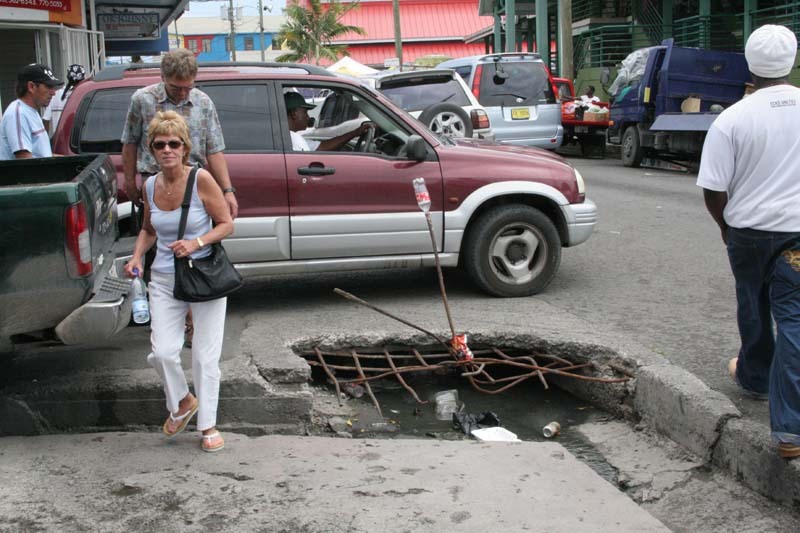 The infrastructure in Antigua isn't quite up to American standards. This was a giant pothole across the street from the market with rebar sticking out of it. Notice the safe caps (Coke bottle) on the end of one of the rebar. Interestingly enough, we were down there again several times and by Friday, the pothole was fixed! 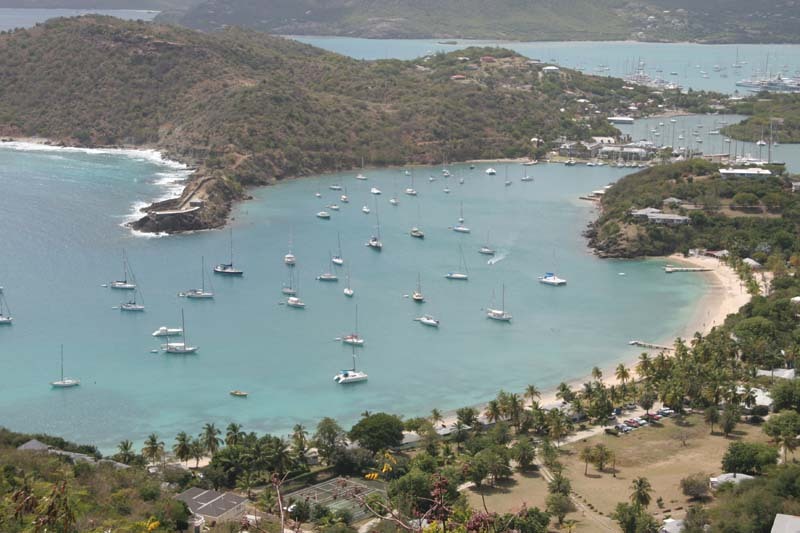 The beach, well, in Antigua they have 365 beaches, as they like to say, one for every day. 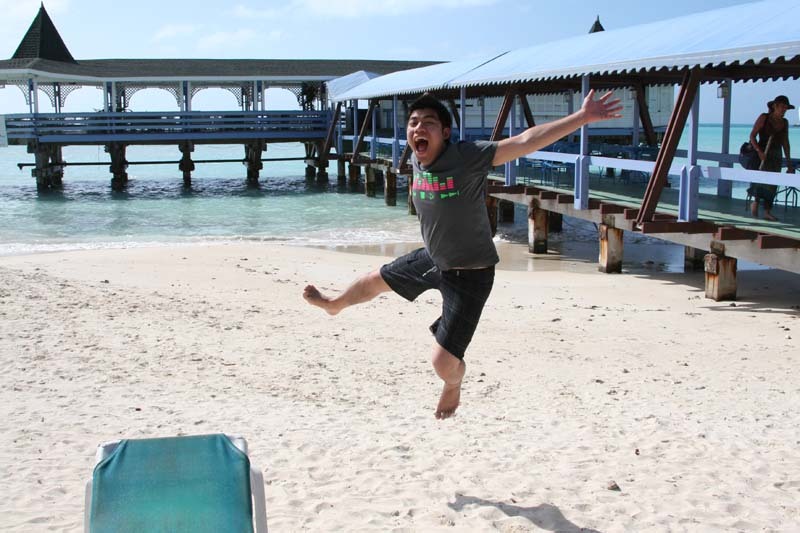 This is Jeremy when he first walked down to the beach. Kind of hard to hold him down. It was mid 80's and goreous. We met there Saturday afternoon to let the kids relax and play. 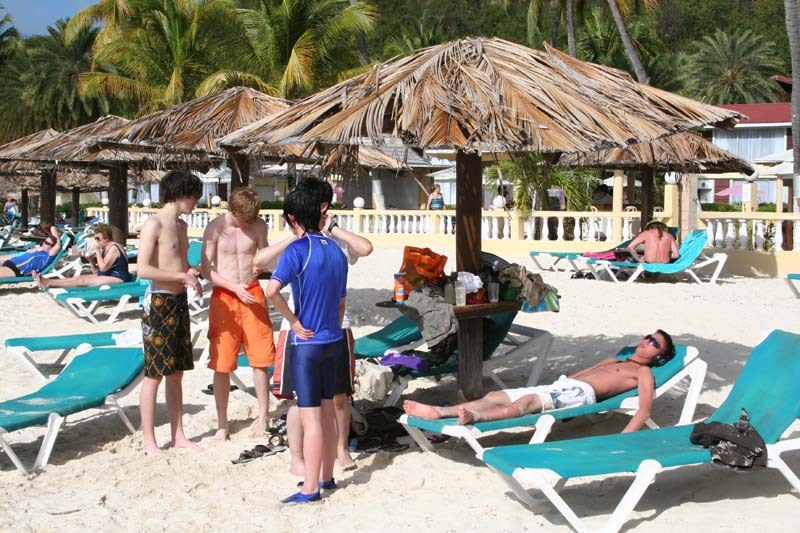 Kids sunning themselves and William doing a better job than most. He was red as a lobster by the end of the day. He is better now but was pretty crispy by the end of the day here. 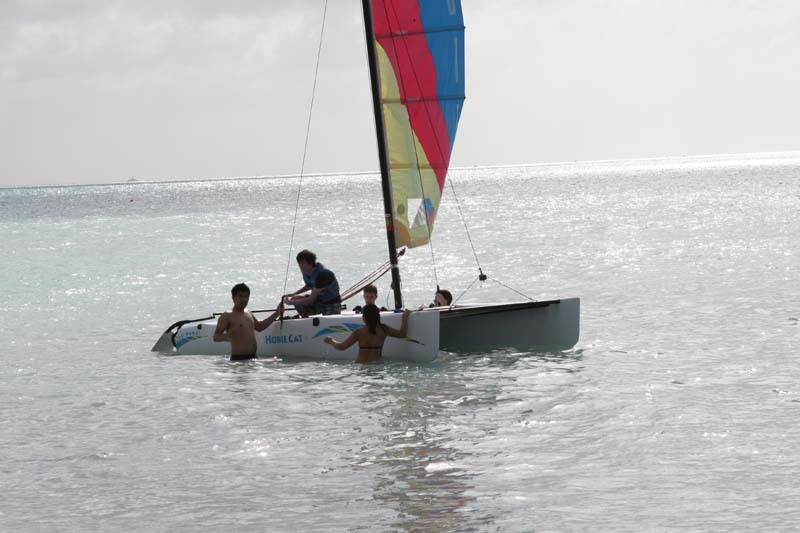 Several of the students were avid sailors so they rented a Hobie Cat and sailed around the protected cove. Don't worry moms, I didn't let them go far and all had to have lifejackets (unlike what you see here). They were switching students at the moment. Having coconut crushes (oooohhhhh my were they good). Virgin coconut crushes, that is. 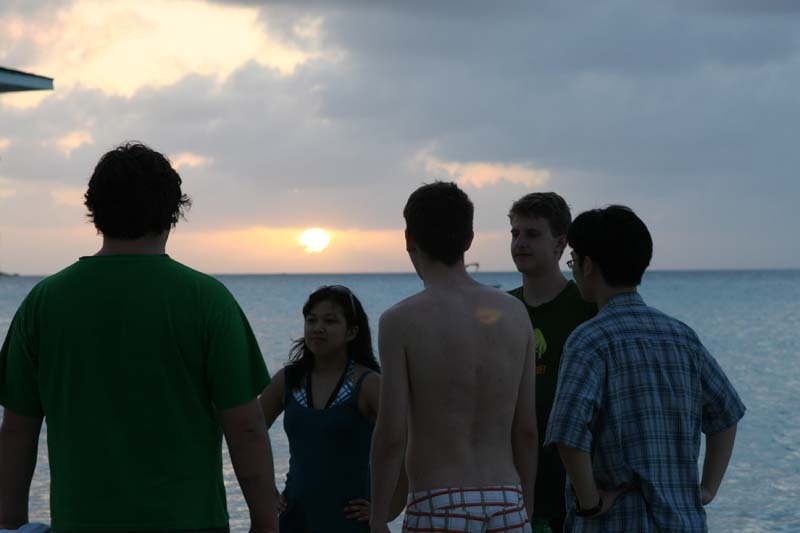 Alex, Tiff, Colin, David and Sean enjoy the sunset. What a gorgeous country this is. Sunday had a small craft advisory so we decided to skip the eco-tour and go on an island tour. This was a group shot at Devil's bridge, a small bridge that jutted out. Beautiful water but very rough seas. Look at the waves in the background. The rocks in the background were about 20 feet high just for scale. Another group shot with John, Rod and myself in it. 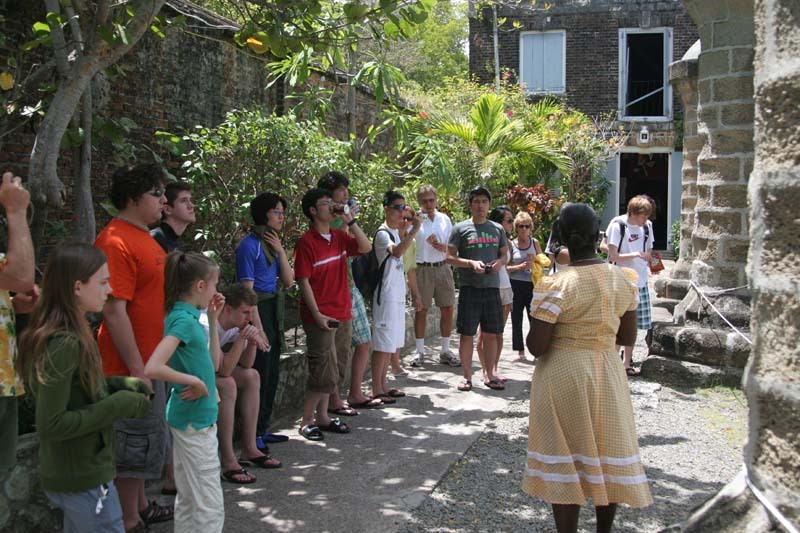 We continued on to Nelson's Dockyard, the only working 17th Century dockyard in the world. Our tour guide at the dockyard was as dry as Nelson's bones but we still enjoyed the tour. After Nelson's Dockyard we went to Shirley's Lookout. This is a view of the harbor from there. What a view! You can see the fortifications to the left and Nelson's Dockyard is the bigger buildings in the upper harbor. As we continued from Shirley's Point (named after the woman who ran the pub up there many years ago) we ran into an old fashioned Whistlestop tour for the now out of power Red party. 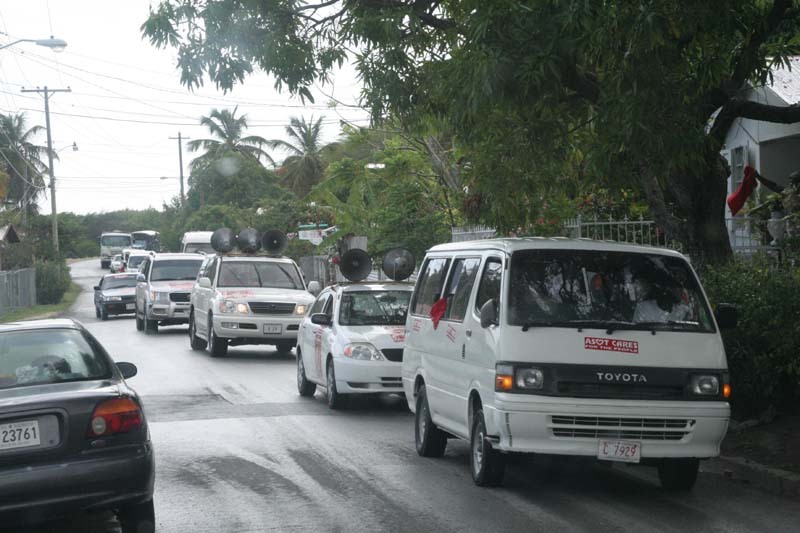 There were over 100 cars travelling along honking their horns and playing very loud music. Other people were talking into huge speakers like the ones on the top of the cars. A ;ittle political history of Antigua. The first Prime Minister, the Honorable Vere Cornwall Bird was elected from 1981 when Antigua was declared independant from England (although the Queen is still technically the head of state) to 1994 when he stepped down because of health issues. His son, the Honorable Lester Bird took over. After many calls of cronyism and a real estate scandal the current Prime Minister, the Honorable Baldwin Spencer was elected in 2004. Above you can see the party of the Honorable Lester Bird campaigning. On Monday we met the Minister of Education at the Rotary house. The Honourable Bertrand Joseph thanked us for bringing computers in and building labs in schools. He said it was always the goal of the Ministry of Education and the Ministry of Technology to increase the technical education oportunities in the schools across the island. 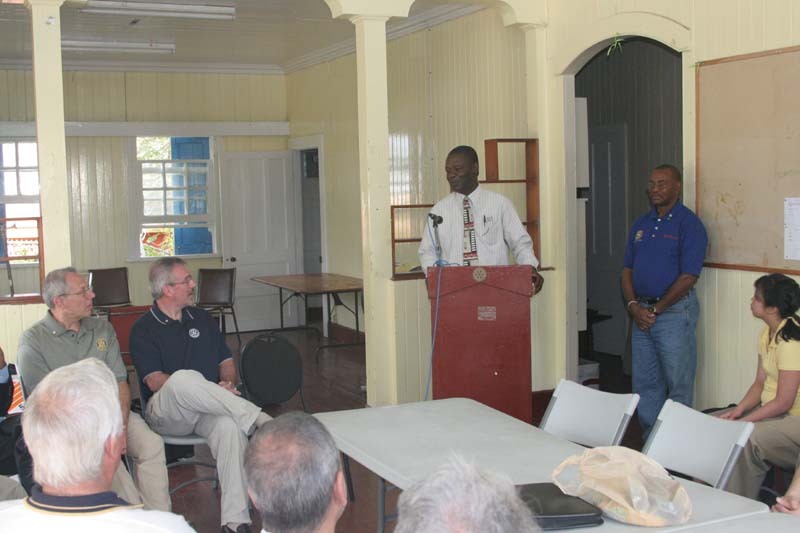 Here the Minister of Education, the Honourable Bertrand Joseph was thanking John and Steve for the help Rotary was providing to schools on the island.